The Book V cover is coming along and artist Carol Phillips is ready to start painting which is always fun! I entreated Carol to go over the top on this cover–this is the Temple after all we’ve waited two whole books to get to it and I wanted it to be unabashed in its evil. There’s certainly nothing subtle about the Temple. 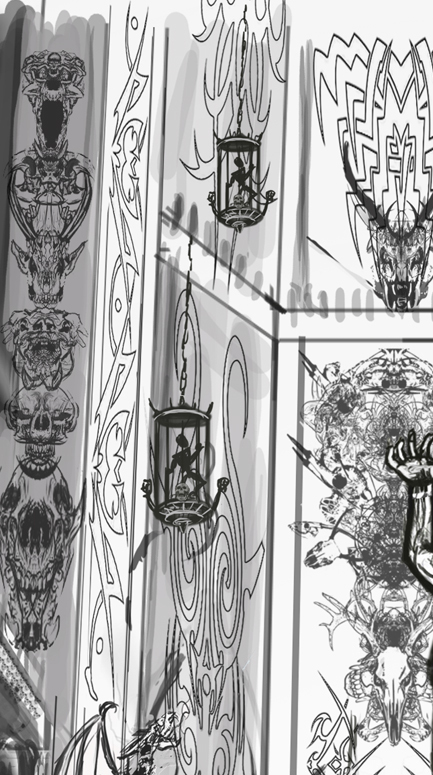 I wanted skulls and leering faces and raging mouths everywhere. As Carahil has been a usual fixture of the past books, he’s present here in this one as well: can you see him??? And then there’s Kay hiding behind a pillar, a fly in this evil ointment. Sort of like when the criminologist comes on in Rocky Horror Picture Show and everybody boos, his presence indicates that the party’s over. My friend, author Michelle Davidson Argyle, needed volunteers to promote a Blog tour to assist the victims of the Earthquake/Tsunami/Nuclear disaster in Sendai, Japan, and I am happy and honored to help. One of the largest earthquakes ever recorded hit the city of Sendai in the Tohoku region of Japan on Friday March 11. The magnitude 9.0 quake unleashed a deadly tsunami that slammed into Japan’s east coast, leaving a swathe of devastation in its wake. Thousands of people lost their lives, and many are still missing or injured. Thousands more have been left homeless and destitute. As a testament to the generosity of the world’s citizens, emergency appeals have been swiftly set up in the aftermath of the quake, but I’m sure many of you, as we did, had the same thought: our donations seem so puny. There must be some other way we could make a difference! With that in mind, Stories for Sendai was born! 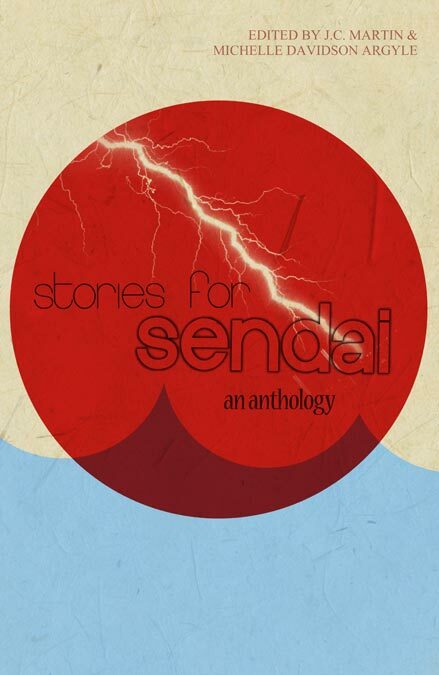 The Stories for Sendai Anthology is a collection of 19 short stories and one poem. Some are inspired by the events of the earthquake in Sendai; others are simply stories of hope and inspiration. All are uplifting and worth reading. Please consider buying a copy of the anthology and spreading the word about this wonderful, uplifting little book. All proceeds go to relief efforts to aid Japan. Stories for Sendai will soon be available in paperback or Kindle format. Book V, the exciting conclusion to the Temple of the Exploding Head saga is due to be published in November, and, even though Book IV still hasn’t been released, things are starting to happen! The manuscript is off at Loconeal for editing. It’s the largest of the three books, topping out at about 120,000 words, it also contains the largest single fight scene I’ve ever written with over 11,000 combatants!! 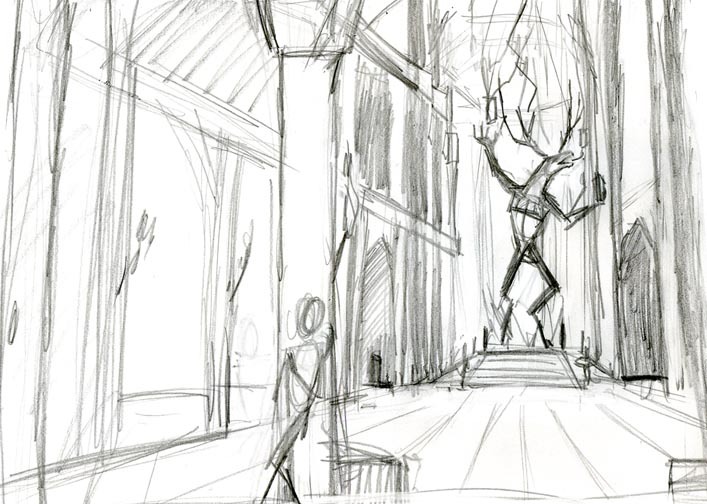 Carol Phillips has begun work roughing out concepts for the cover. 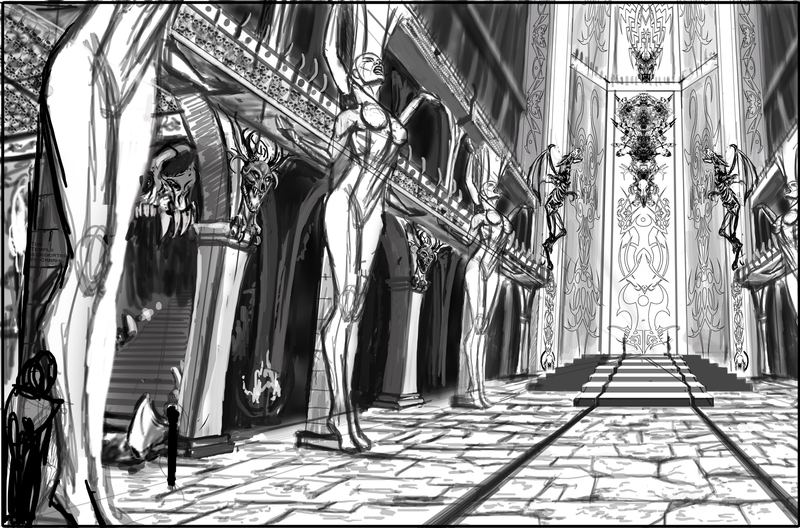 We usually hash out a number of scenes from the book and pick which one is best, but, in this case, a scene inside the Temple of the Exploding Head is a must. We just need to get the sense of scale right. The Temple is a mile long and half a mile wide with the ceiling about a thousand feet up. It’s so large inside the Temple, it often clouds up and rains (I got that idea when visiting the Astrodome as a boy. I was told the climate had to be carefully controlled otherwise it would rain inside the Astrodome). 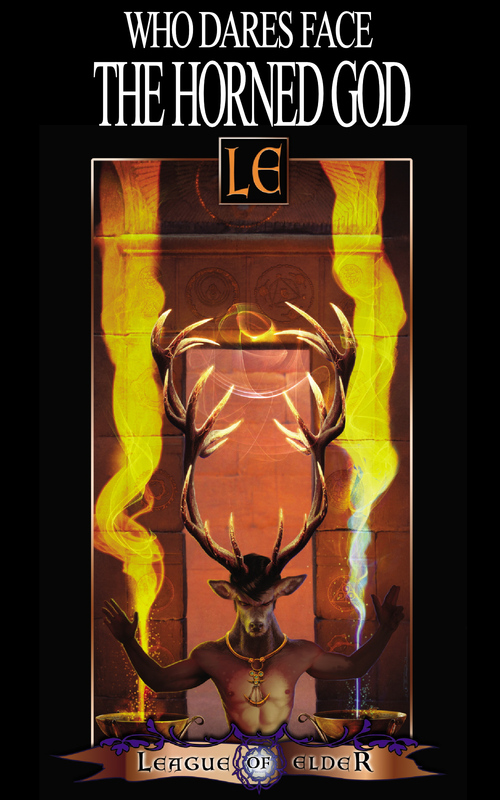 As it is the Horned God’s temple, all sorts of horrible things are going on inside, and we’ll have to temper it down a little for the cover. 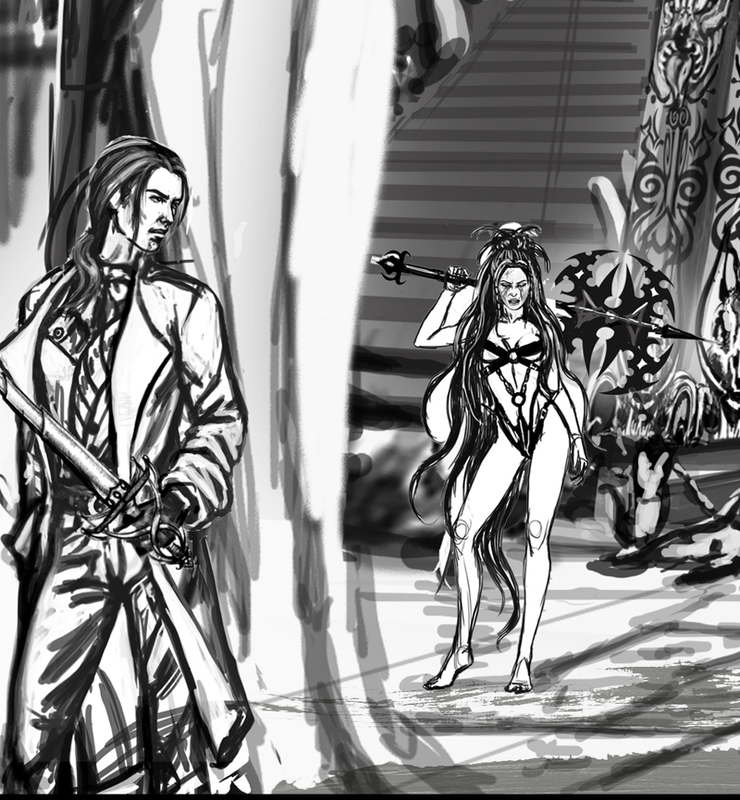 Certainly we’ll have the Horned God himself in the background, along with several Priestesses and a number of sacrificial Monama victims. There will also be a number of captive gods in the scene ready to be handed over to the Horned God’s servants, the Kestrals. I’m debating as to whether or not Sam will be on the cover. I’m also ready to begin pumping out promotional material, banners, table cards, and so on. I should have most of this stuff ready by the Book IV launch Party at Fandomfest in late July. It all should make for a busy summer. 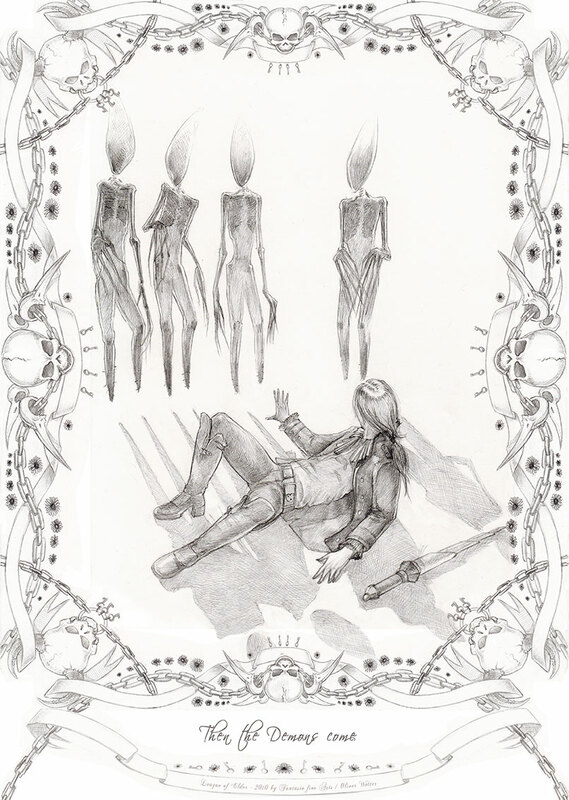 THE XAPHANS HAVE KNOWN OF THE FLESHLESS DEMONS THAT STEP OUT OF THIN AIR FOR CENTURIES. The outlying League worlds also know of them. On Onaris, they’re called Jennybacks, on Bazz: Fa Zemlas. The most common name for them is the Xaphan name: Killanjo. Killanjo are almost always horrid versions of a loved one: a brother or sister, a parent or other such relative–though the person they resemble is often alive and well when they make their appearance. The Killanjo are terrible to behold. Their bodies are bent and mal-formed and are always skinless. As such, they drip and reek. They often have extra appendages fused to their bodies. They are said to wear delicate golden masks covering their bleeding, mutilated faces. Killanjo often are seen in command of Berserkacides and use them to do most of the fighting and killing. The entire House of Monama appears to greatly fear the Killanjo, that they “watch them” at all times and then force them to do their foul bidding. 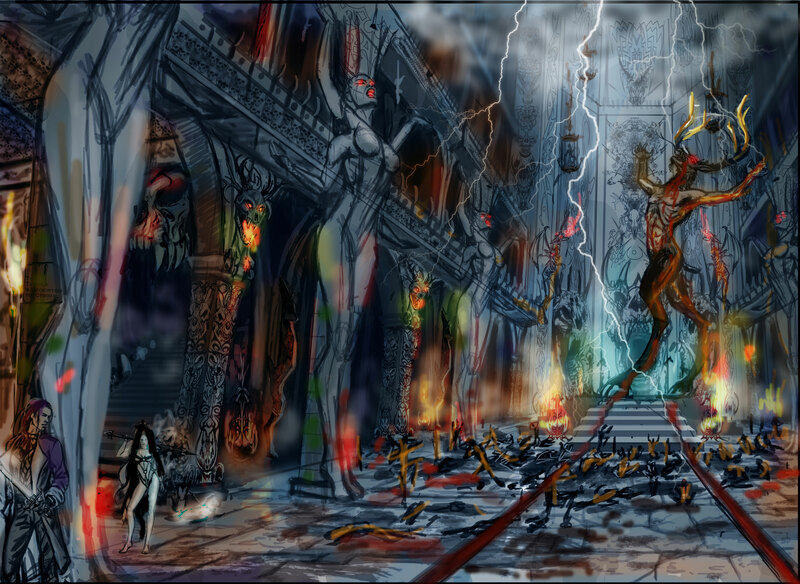 The ancient Remnath hero, Atrajak of Want, led an army of Monamas against the Killanjo in a series of battles called the Hidden Wars. 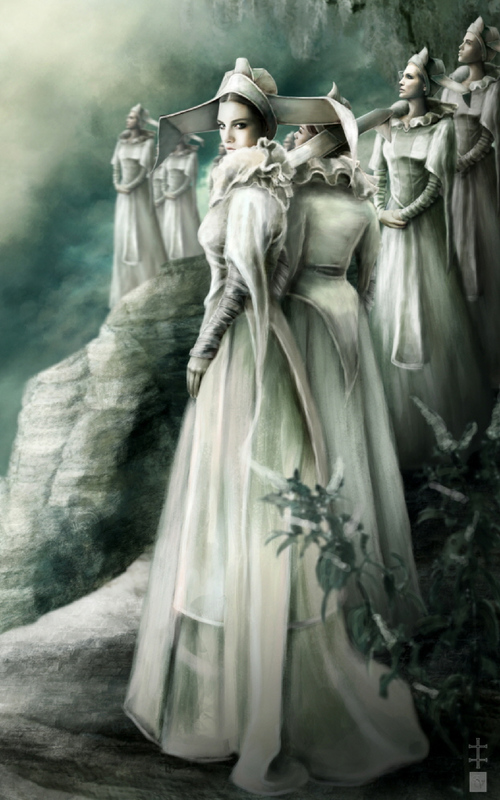 In Atrajak’s writing, which has been banned by the Sisterhood of Light, he mentions the Killanjo themselves were slaves of a greater enemy he called “The Golden People“, of which virtually nothing is known. The Killanjo are also conjectured to be out-of-joint in time, possibly from the future. Their skinless, semi-pickled appearance is ideally suited to project their bodies from the theoretical rigors of time-travel. Their purpose appears to be to create strife and terror, and they are very effective at doing just that. They appear out of thin air and typically fall upon their intended victims when they are most vulnerable. The Killanjo sometimes attempt to kidnap their victims, to drag them away to an unknown fate. 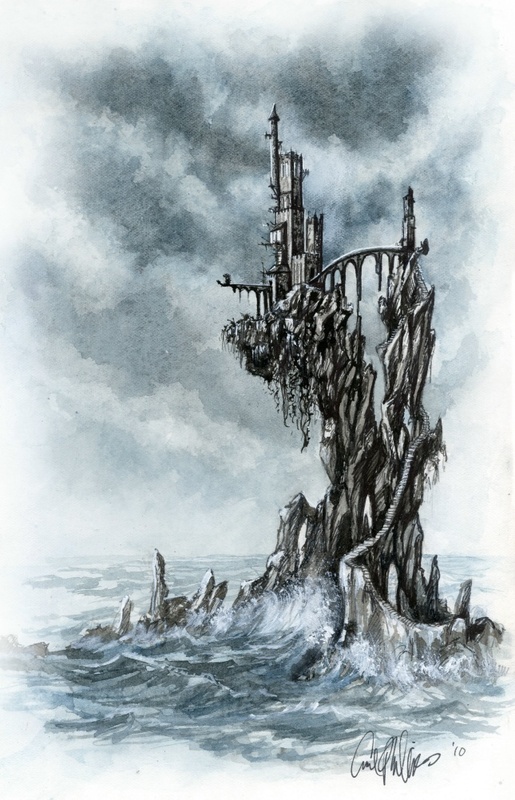 The Xaphan House of Prim, which vanished without trace, were said to have been carried off by Killanjo. They are commonly reported to be able to cast spells rendering most people who hear it immobile. They are also cannibals and will eagerly devour the flesh of any who fall under their spell. They are also said to have several key weaknesses. 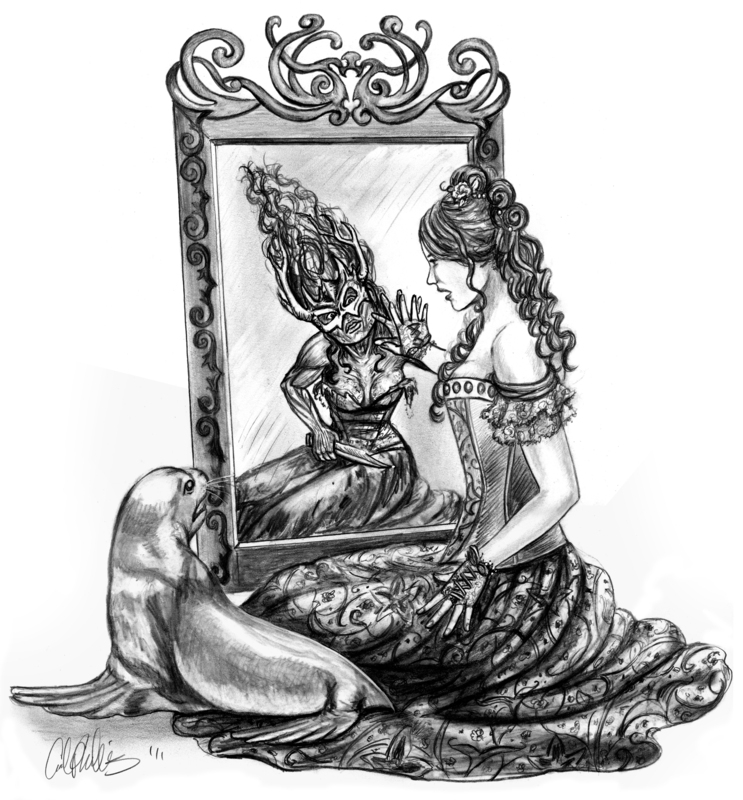 They fear their own reflection and cannot look at it and, accordingly, will flee from mirrors. Also, they are not reported to be overly strong fighters, having to rely on their spells or their Berserkacides to fight for them.